A survey of the Byron area by the American Lutheran Church (ALC) in 1962 confirmed the need to establish a Lutheran church in Byron. 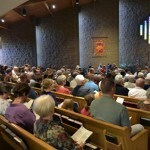 Reverend Russell B. Helgesen, Regional Director of American Missions of the American Lutheran Church, Elmer Ward, Clerk of the Village of Byron, and Pastor Curtis Johnson, St. John’s Lutheran Church of Kasson, were instrumental in working with the ALC on establishing Christ Lutheran Church as a mission church. In March 1962, the ALC purchased 5 acres of land at the current site and construction began that summer. A parsonage was purchased in the fall and Pastor Larry Kocha arrived with his family on January 3, 1963. Pastor Kocha began calling on people of the Byron community to lay the groundwork for a new congregation and recruiting volunteers to help finish the inside of the church. The first worship service was held on Feb 10, 1963 with approximately 350 people in attendance. Sunday School began on February 17th with 135 students enrolled. 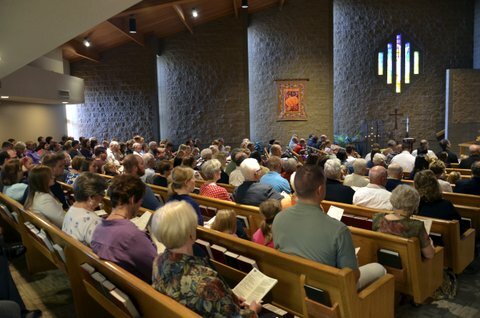 On February 24th, a second worship service was added and a Steering Committee formed.On April 27, 1963, a congregational meeting was held and a decision made to join the ALC and adopt a constitution. On April 28th, Rev. Russell B. Helgesen, officiated the worship service which officially organized CLC with the installation of Pastor Kocha and the Church Council. The congregation began with 412 baptized members and 217 confirmed members.In November 1963, a resolution was adopted to purchase the land and church property from the ALC for $66,000. Bethlehem Evangelical and Union Prairie Lutheran Churches of Lanesboro, MN sponsored CLC in this endeavor via two 5-year mortgages on December 4, 1963. In 1969, CLC secured its own loan relieving the Lanesboro churches of their responsibility as sponsors. Over the course of 50 years, our church has continued to grow and transform. We have been blessed to have a number of wonderful pastors serve our congregation along with a host of talented people filling leadership and staff roles. A number of new roles were added at various times and there have been 3 major building expansions. First, an educational wing was added on the north end in 1965. A second educational wing was added on the south end and the sanctuary remodeled in 1976. Then in 1995, a new sanctuary, narthex, and offices were added along with the kitchen being remodeled and the original sanctuary converted into the Fellowship Hall. As with all churches, we too have had our challenges. However, just as trees get stronger with the wind, we too by God’s grace become stronger and grow in our faith during the challenging times. Today, our congregation is thriving and actively seeking to fulfill its mission to ‘Make Christ’s love known by equipping all ages to lovingly serve God and people’. We can see the harvest of many of the seeds that were sown by God’s people over the past 50 years. Four members of CLC have become pastors. Two members have become missionaries. Our membership is increasing along with attendance in worship, Bible School and River of Life. We have a wonderful facility that is continually being refurbished and shared with many in the community. Five local non-profit organizations use our facility ever year for a multitude of meetings. We are actively involved in a number of mission and outreach activities such as Interfaith Hospitality Network, Channel One, and a yearly youth mission trip. Many thanks to all who have been with us on this journey! Let us go forth to build on the foundation that has been laid with new and innovative ways for “Making Christ’s Love Known” for the next 50 years! Below is a picture of many of our charter members.